Birse Community Trust, BCT, is a local community business "to promote the common good of the inhabitants of Birse parish and deliver wider public benefits". Since its inaugural AGM in February 1999, the Trust has taken on an expanding range of projects to address local issues and capitalise on local opportunities. BCT won the Community Business prize in the 1999 Scottish Community of the Year Awards and its success has continued to attract favourable comments from Scottish Executive Ministers and other prominent commentators. Recently, for example, the Chief Executive of Aberdeenshire Council, reported that BCT: "is exactly the type of local community initiative which Aberdeenshire Council wants to encourage more widely throughout our area. The Council congratulates the Trust for establishing a very successful track record as a pioneering local community business". 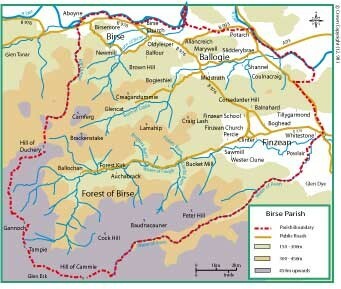 Birse 's neighbouring community to the south is Glen Esk across the hills in Angus; to the west, again across hills, it is Glen Tanar; to the north, the parish boundary is the River Dee, with the main link being across the bridge to Aboyne; to the east, it is Strachan parish which, while part of Feughside with Finzean, has been divided from Birse by a parish boundary which for about 900 years was the county boundary between Aberdeenshire and Kincardineshire. Birse Community Trust has a website, click here to access.